Hepatitis C – “Frozen War” with an Invisible Enemy. Results of the national testing. On 10 August 2016, Alliance for Public Health (Alliance) during its press briefing in the Ukrainian Crisis Media Center announced the results of the national rapid testing for hepatitis C among general population, which was organized together with partner civil society organizations in all regions of Ukraine on occasion of the World Hepatitis Day within the traditional all-Ukrainian “Demand Treatment!” advocacy and awareness-raising campaign. The testing results raise serious concerns. 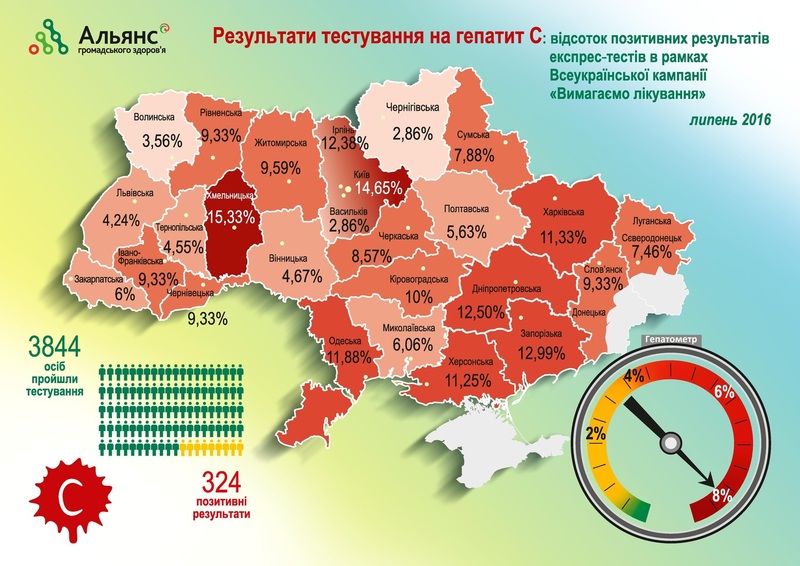 In total, 3,844 individuals were tested in 26 cities in all regions of Ukraine (except occupied areas), with rapid tests showing the presence of antibodies to hepatitis C in 324 cases (8.5%). It should be noted that testing was conducted among general public as the campaign was organized in parks and on central streets of cities and towns. For many of people who tested positive, their test results were totally unexpected as the trickery of hepatitis C is that it does not develop clinical manifestations for a long time. There were both young and senior people among those who tested positive for hepatitis C. “Among those tested there was a guy of about thirty years of age, who decided to get tested only because it was free of charge, so he joined his friend – he was confident that he had no virus, but his result came back positive,” – told the campaign coordinator from Sloviansk, Mykhailo Karelin. “There was an elderly woman, who was just passing by on her way to the railway station with her suitcase. She had ten minutes of spare time, so she decided to get tested. She tested positive and it was a real shock for her. Her reaction was quite unexpected: “Why did I have to run into you? I don’t know how it could happen! What should I do now?” We invited her for a counseling session with an infectious disease doctor and referred her to a healthcare facility”, – told us the campaign coordinator in Poltava, Kristina Kryzhenko. It is disturbing that most people who were tested within the campaign have never been tested for hepatitis C before (from 85 to 98% depending on the location); in particular, only one person out of 160 people tested in Severodonetsk had been tested before, and in Sloviansk none of 150 people tested went through such testing in the past (meanwhile 14 positive results were received there). All previous national testing campaigns as well as this-year campaign confirm once again that the situation with hepatitis C is becoming more and more alarming! Hepatitis C diagnostics is still critical as hepatitis testing is not included to the list of mandatory medical examinations, so most patients (even the military who took part in the armed conflict in eastern Ukraine) become aware of their disease at advanced stages. Since 2012, Alliance ran over 119,000 tests among the members of key affected populations (first of all people who use drugs), and during five years of all-Ukrainian campaigns over 13,500 people from among general public were tested, with the percentage of positive results always ranging from 8 to 12%. The situation with government funding is also critical. In 2016, the current National Targeted Social Program of Viral Hepatitis Prevention, Diagnostics and Treatment is coming to its end. In its official response to Alliance as for the development of a new program for the period till 2021, the Ministry of Health replied that in 2013 – 2016 only very limited amounts of budget funds were allocated to procure medical drugs; as for other activities – they were not financed from the budget at all! The total funding shortfall of the activities stipulated in the national program is 79% of the amount planned back in 2013. The formal reason of refusal to develop a new national program on viral hepatitis, which was supposed to come into force in 2017, voiced by public officials is the ban on the use of public funds approved with the resolution of the Cabinet of Ministers of Ukraine N 65 dd. 1 March 2014. “Hepatitis C is a curable disease. Nevertheless, in our country the situation has turned into an epidemic. Under such conditions, freezing resources to fight hepatitis C means capitulation and betrayal from the side of the state towards its citizens who are in need of treatment. Keeping in mind the disturbing results of the national testing, we demand to lift the “veto” from the development of a new national program on viral hepatitis. Alliance appealed to the President and the Prime Minister with a request to urgently approve the National Plan towards Hepatitis C Elimination, the implementation of which will help Ukraine to eradicate this disease in our country and save the lives of millions of Ukrainians. The experience of Alliance, which two years ago launched the first in Ukraine treatment program using a new-generation drug, clearly demonstrates that this goal is achievable! We were able to access innovative drugs and have already treated over 600 patients with most complicated cases – and in 93% of those who received the treatment the virus is undetectable, which is currently the best treatment success rate for hepatitis C in Ukraine,” – said Andriy Klepikov, Executive Director of the Alliance for Public Health. Over 150 million people are infected with hepatitis C globally, with up to 4 million people living with HCV in Ukraine. Most of them are not aware of their disease as in 80% cases the acute stage of disease is asymptomatic. One of the priority areas of activities of the Alliance for Public Health is fighting the spread of the epidemic of hepatitis C in Ukraine and providing HCV diagnostics and treatment for key affected populations. In 2012, Alliance initiated all-Ukrainian “Demand Treatment!” advocacy campaign primarily aimed at scaling up access to diagnostics and treatment of hepatitis C in Ukraine. Since 2015, the Alliance Center on HIV, Hepatitis C and Drug Use has been implementing a global campaign, Unite to Eliminate HepC: Know It, Test It, Treat It. Paragraph 16 of the Resolution of the Cabinet of Ministers of Ukraine dd. 01.03.2014 N 65 “On budget savings and prevention of budget losses” terminates the development of new national targeted programs or amendments to the approved targeted programs, which require additional budget funding.